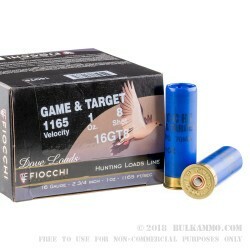 This 16 Gauge shell by Fiocchi is loaded with one ounce of #8 lead shot. 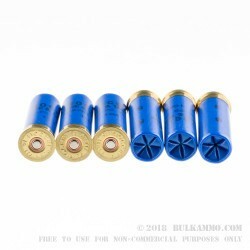 With 410 of the .09” diameter pellets to direct wherever you please, you’ll have a versatile load that will suit you in the field as well as on the range. Like the bird on the box implies, doves and pigeons are perfect for this shot, and it will give you an ideal spread at 30 yards for targets their size. Its relatively dense pattern can bust fast traveling clays as well. 16 Gauge shells are a little hard to come by these days, but catering to the needs of all shotgun hunting enthusiasts is the name of Fiocchi’s game. 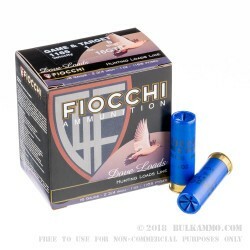 One of Italy’s oldest ammunition manufacturers and family-owned since its foundation in 1876, Fiocchi is a great go-to for all hunters with their shells’ strong casings, reliable primers, and quality American powders.